Our range of products include Expense Claims such as Payroll Software, Advance Payments Payroll Software, Online Workflow Payroll Software, Expense Claims Software and Workflows Software. greytHR's Expense management software lets you configure multiple expense heads and define limits and rules for claiming expenses. 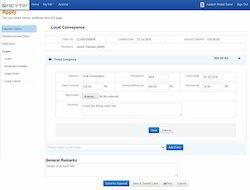 Multiple expense forms for Team/ individual can also be configured. Payment cycles, mode of disbursement (cash/ bank transfer) and processing (individual/ batch) can also be defined. Looking for Expense Claims ?